The Chicago Bulls have one more game before the season is over. They won’t make the playoffs for the first time in eight years. 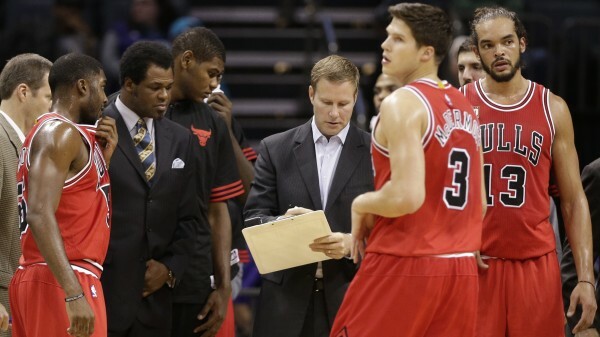 Fred Hoiberg failed to implement his offensive philosophy with a roster that doesn’t fit it. They seem to have too many big men in Pau Gasol, Joakim Noah and Taj Gibson. And there’s the Derrick Rose-Jimmy Butler elephant in the room. An interesting Deadspin article, which is basically a compilation of what the Chicago media outlets had to say about the team, or in other words letting the dirt rise to the surface now that the season is basically over. Basically, nothing good was going on this season, and it all started way way back, even before Tom Thibodeau was fired. The Chicago Sun-Times report that the John Paxson and Gar Forman tandem started poisoning players on Thibs back in the summer of 2014. It’s not just that. Hoiberg benched Joakim Noah at the beginning of the season, which didn’t really help things. Derrick Rose, when healthy, was probably the best player on this team, but he was never the leader. It was Noah, Gibson and Hinrich. Noah may have liked the idea of playing more minutes next to Gibson at first, but at some point didn’t like less minutes and coming off the bench after starting his entire career. Trade rumors weren’t beneficial. In the end, the injury cleared up minutes in the frontcourt, but Pau Gasol is such a problem defensively these days, that clearing up the rotation didn’t aid one bit. Not when injuries continue to plague this team. Nikola Mirotic, when healthy, seems to love taking bad shots too much. Doug McDermott can’t defend and although he has improved this season, the Bulls still couldn’t rely on him for consistent offense off the bench. Tony Snell was never healthy enough and like McDermott, his offense has yet to evolve (and maybe never will) into something the Bulls can count on night after night. And then we get to the heart of the problem. 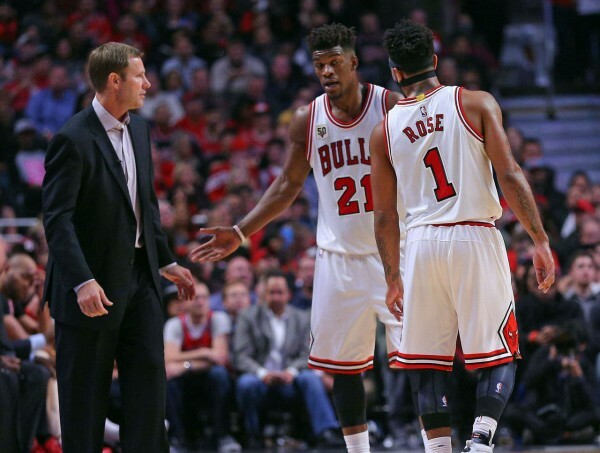 The Butler-Rose backcourt. Two players who cancel each other out, by needing the ball in their hands to create points. Butler is the better one right now, especially on the defensive end. While players around him might not be huge fans of him, but everyone admires his work ethic and fantastic job on defense, even if he does have nights when he’s less than stellar on that end. What’s the problem – trade one of them. But the Bulls don’t want to trade Butler and can’t trade Rose, who’ll be making more than $21 million next season, the last one before becoming a free agent. And there will be a lot of questions about Rose’s free agency. He was very good after the All-Star break, but can the Bulls rely on that? A lot of that came due to Butler missing games with a knee injury. And Rose isn’t half the defender Butler is. There’s also the connection with Hoiberg, who probably isn’t the biggest fan of Butler’s too. For his offensive style to work, Butler and Rose (but especially Jimmy) need to pick up the pace and do less isolation and long dribbling sessions. If this team stays together (Gasol and Noah are free agents) which mostly refers to the starting backcourt, Hoiberg needs to either force them to change their style, or himself completely rework the way this offense operates, and hope it finally fits.